Day one of Pro Tour Fate Reforged was a good one for me! I went 2-1 in draft and 3-2 in Modern, and qualified for day two. My draft went great. I went into the draft planning on forcing some version of Mardu. This worked out well because I was able to first pick a Kolaghan, the Storm’s Fury. After that I couldn’t help myself but pick up a couple more dragons over the next few picks: Shockmaw Dragon and Noxious Dragon. The highlight of my day was playing Kolaghan with Dash when I had the other two dragons in play and attacking with all three of them. I picked up three dual lands to help smooth my mana. Except for my dragons, everything in my main deck could be played for four or less mana. Against slow decks I often brought in Throttle and Rite of the Serpent and once I brought in Summit Prowler. 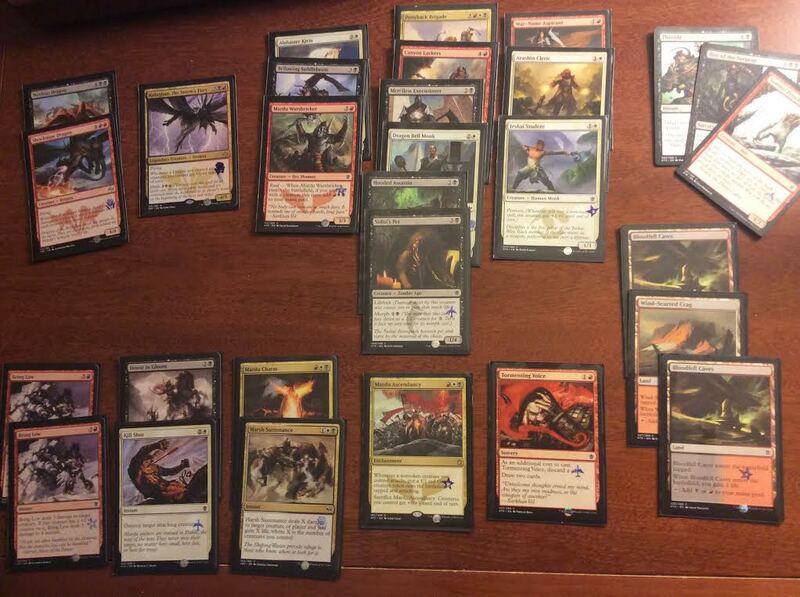 Part of the problem with the Prowler and the Rite was my mana base: 7 red, 7 white and 6 black. While I had a little more black than white in my deck, all of my turn-two plays were either Red or White. Surprisingly, the player drafting behind me directly to my left also went Mardu, so the second pack was weak for me. Apparently, he opened an Archfiend of Depravity. I had to face him when I was 2-1. He manifested a card in game one. After I played a third and fourth creature to gain board advantage, he flipped the manifested card on my turn to reveal the Archfiend and take control of the game. Needless to say, I’m excited to be making Day 2 with a 5-3 record. I’m going to need to catch a few breaks to do well on day two, because the competition is sure to be much tougher.